We're going to use gpg4win. Of course you should verify the download as described in part two of the series. Right click on the installer --> Run as administrator. Kleopatra – The gpg GUI client, not required for working with e-mail. GpgOL – A plugin for Outlook. Please install if you're planning on using Outlook instead of Thunderbird. GpgEX – Context menu entries for the Windows Explorer. We don't need those at the moment. The suggested installation directory is just fine, so go ahead and start the installation. In case you're wondering, why the listed versions differ to this of the download: That's normal. The components included in the download each have a custom version respectively which may not match the download's version. 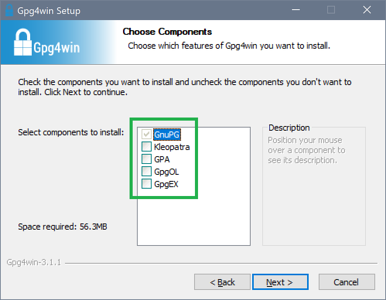 In case gpg cannot be found on the console, you'll need to add the directory bin – which is located directly under the install directory – to the system's search path for executables. See part two of the series for details on how this can be done. Create a directory of your choice, e. g. C:\Users\YourUser\gnupg. Copy the contents of C:\Users\YourUser\AppData\Roaming\gnupg into the new directory. Create a new environment variable named GNUPGHOME and give it the directory path as value. Restart the console and check if the change has been recognized with: gpg --version. The language of gpg output can easily be changed. It's controled by the environment variable LANG. Accepted values are so called ISO 2 country codes, e. g. de stands for German and en for English. Either you set this up as described in part two of the series, or just for the lifetime of the console ("temporary") via set LANG=en. # we need to disable this in order to being able to import them anymway. Just copy the contents into GNUPGHOME\gpg.conf and you are done. gpg is now sufficiently set up and may be used at you convenience. The next step shall be the generation of your private key. A detailed description on how this may be done can be found in the next part of the series. Only then does a setup of an e-mail client + OpenPGP makes sense. If you're of the impatient sort, you may want to have a look at the high quality tutorial over at posteo.de which deals with Thunderbird+Enigmail. Although the generation of keys with Enigmail is described there I do recommend to do this on the console. This gives you the opportunity to learn something and as always there are some pitfalls to watch out for. More on this in the next part. It is possible to make gpg print error information to the console or into files. You'll need advanced skills in order to make use of this, but I'll describe how it's done nevertheless (and because I do tend to always forget these things). The kind of output produced by -v and --debug depends on the gpg functionality used. In general it's adviced to start with -v and then slowly tune things up to your desired level of verboseness. dirmngr - Takes care of communication with key servers. gpg-agent - Provides gpg functionality for other apps, e. g. Enigmail. sc-daemon - Provides access to smartcards, e. g. Yubikey. It's recommended to use an absolut path for logfiles so that you may have more control over the location of the file. That pretty much makes our little debug excursus complete. We'll continue with key generation in the next part of the series.